This method of cooking sea bass (Lavraki) is popular on the island of Cephalonia, especially in Fiskardo, where large amounts of the fish can be found in the sea. What makes it different is that the stomach is filled with the garlic and herbs and it is baked wrapped in greaseproof paper. 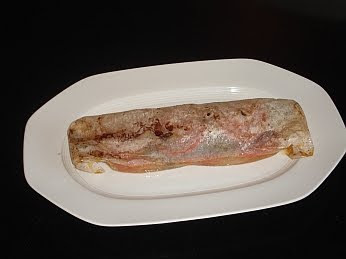 It's quite easy to prepare, if you are used to cleaning fish. Clean and scale the fish, making sure you clean inside the head and stomach. Salt the fish both outside and inside the stomach and set aside. Cut 6 horizontal slices from each tomato. 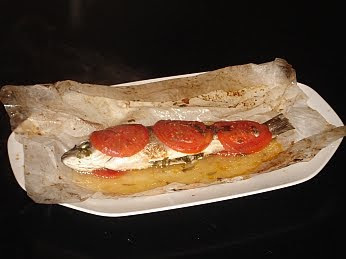 Place 3 tomato slices in a row in the centre of each sheet of greaseproof paper. Place the fish on top of each row of tomatoes. Put equal amounts of garlic, parsley and oregano in the stomach of each fish. Sprinkle olive oil over the fish. Place 3 tomato slices on top of each fish. Place all 4 in an oven dish and add the remaining olive oil, the white wine and 1 cup of water. Bake in a pre heated oven at 180 degrees Celsius for about 45 minutes. Looks great. I will try it tonight. I love seabass! and this is surely a tasty dish! Came out well. Skipped the tomatoes, though.